The artist’s work is devoted to biblical and antique subjects. In his paintings a large role is given to the landscape, which complements and sets off the plot. Semiradsky called landscape painter of historical genre. The beauty and harmony of the surrounding world were central to the artist’s work. The images of people are a little static and sometimes not very impressive, but the general atmosphere of the harmony triumph makes it possible to speak of the master’s paintings as world masterpieces. A representative of the late academicism, he caused criticism from critics for the excessive detailing of the surrounding space. And admirers admired the patterns written on the marble columns and applauded the play of shadows on the olive leaves. One of the most famous was the picture on the biblical story “Christ and the sinner.” The basis of the idea was the poem by A. K. Tolstoy “Sinner”, in which the harlot experienced spiritual cleansing and rebirth under the influence of the power of the person of Christ. 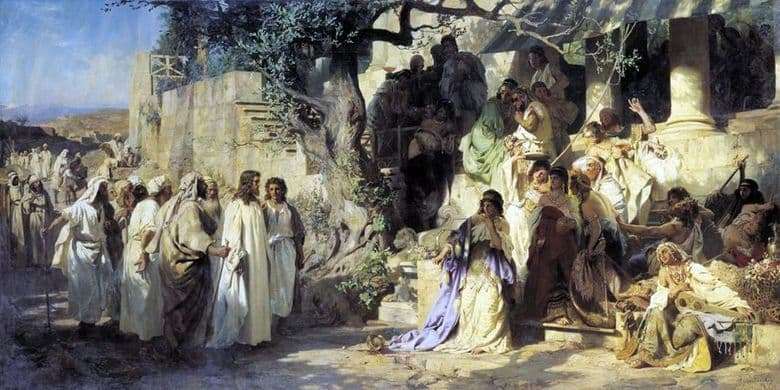 The composition of the painting is based on the opposition of two groups: Christ and his followers and the courtesan, with a crowd of brightly dressed people. the division into two parts informs the picture of the idea of ​​initial antagonism and subsequent joining. Small details, written with great care, inform a lot of information about the characters. Features of symbolism: white clothes – a symbol of purity; untidy, although rich outfits – a symbol of riotous life, complement the characteristics of the characters. The picture was a big hit, and the artist was awarded the title of academician of the Imperial Academy of Arts. In this picture, for the first time, the artist used the techniques of connecting the scale of the historical plot and the planer effects.